Although Batman and Robin's radio appearances are not a frequent as Superman, The Caped Crusader was known to fly into many fun radio episodes. 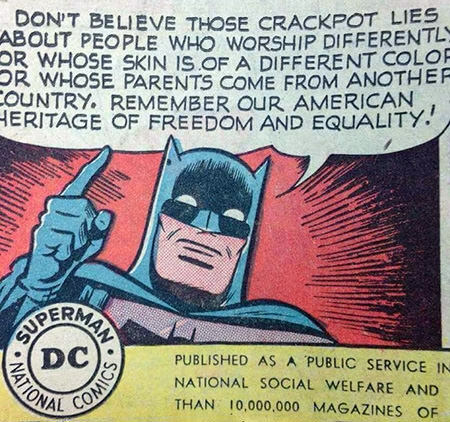 "The Batman" debuted in Detective Comics No. 27 in May 1939. The character, created by Bob Kane, was an attempt by National Publications to find the success that Action Comics was having with Superman, who first appeared in Action Comics No. 1 in June, 1938. Action Comics and Detective Comics were two of the companies which would eventually form DC Comics in the early 1940s. When the costumed superhero began to fade from popularity, the company rekindled interest in June 1952 by teaming Batman and Superman in Superman #76. In this issue, the two heroes discover each other's secret identities. The pairing was a financial success and would be repeated numerous times over the years in comics. The Adventures of Superman radio show ran for 2,062 episodes between 1942 and 1951, whereas Batman only had a few scattered episodes on his own. These include the single episode of The Batman Mystery Club and Batman and Robin's Christmas Carol Caper. However, Superman on the radio needed the help of the Caped Crusader and his sidekick Robin on several occasions. To be sure, Batman was more likely to be written into the plot when Superman star Bud Collier was due for some time off, but Batman was an important part of Superman's radio world. On the radio, Superman was able to deduce Batman and Robin's identities by using his X Ray vision to look under their masks. In December of 1945, Superman is in desperate need of the Dynamic Duo's aid. In the previous story arc, the Atom Man discovers that Superman is rendered helpless by kryptonite. Although Superman escapes the Atom Man, there are still some pieces of kryptonite out there, so he enlists the help of Batman and Robin since they are not affected by the otherworldly substance. In the "Is There Another Superman?" story arc beginning January 29, 1946, Bruce Wayne and Clark Kent investigate a series of bank robberies on the outskirts of Metropolis. The only possible suspect is Superman. Can Batman clear his friend's good name? Batman becomes part of more than a dozen Superman story arcs, each from five to thirty five episodes long, making the Caped Crusader nearly as important to The Adventures of Superman as Lois Lane and Jimmy Olsen. One element of Batman, which does not make it to The Adventures of Superman, is the Caped Crusader's Rogues Gallery. For the most part, Batman's enemies do not possess any superpowers. They are however costumed (and often insane) criminals with strong ties to organized crime. The most recognizable is The Joker. A fall into a vat of dangerous chemicals had bleached The Joker's skin a clown white, turned his hair permanently green, and forced his bright red lips into an eternal grin. Nick Carter, Master Detective goes up against a villain very similar to the Joker in "The Case of the Poker Murders". The bad guy is the Ace of Spades, who names his henchmen for playing cards and leaves a face card whenever he strikes. This collection also contains the complete story lines of Adventures of Superman in which Batman or Bruce Wayne make an appearance. The collection also contains two rare recording: A Baman Christmas special and an audition program from 1950 of "Batman Mystery Club" (the only episode of its kind in existence). Be the first to comment on "Batman in Old Time Radio"